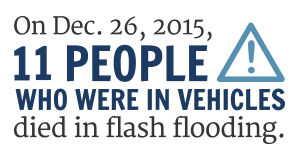 From 2015 through 2018, 34 of Missouri’s 39 flooding deaths – 87 percent – were people who had been in vehicles. 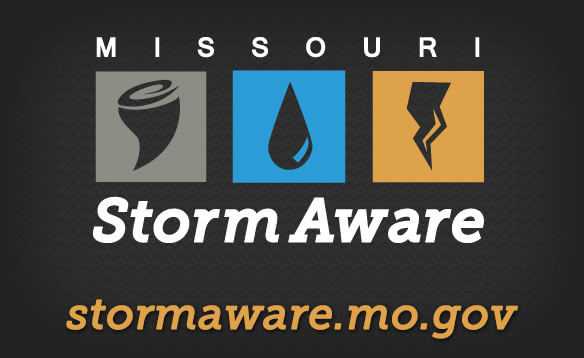 In 2015, alone, flooding killed 27 people in Missouri, more than the previous seven years combined and the highest total since 1993. Twenty-three of the 27 people who died had been in motor vehicles. 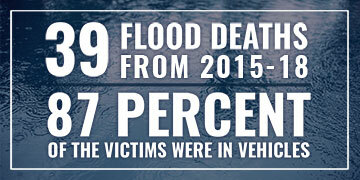 Flash flooding is the leading cause of flooding deaths and historically more than half of the people killed by flooding were in motor vehicles. Flash flooding fatalities statistics provided by the National Weather Service.